A lot of research in astrobiology is directed toward the question of how life can, and did, arise given a certain set of conditions, in an attempt to shed light on how likely it is that it might have happened elsewhere in the Universe. Another area, somewhat less well represented, is the study of how these conditions are created in the first place. That is: what physical mechanisms must conspire for the formation and stable existence of a habitable planet such that chemical and biological can take over and cause life to be created? With an ever-increasing number of observed exoplanets, theorists are working hard to construct models that can explain the systems that we observe and ultimately provide data on their expected abundance in the Universe and their long-term stability. This often involves working with fundamental physics such as gravitation or fluid flow, in the context of a young solar system. Due to the fundamentally insoluble nature of any complex interaction between more than two bodies under gravity, the majority of research into the evolution of such systems takes the form of computational simulations. This book is presented as a series of review papers, broadly providing a summary of the current (published 2010) state of research into extra-solar planets. It begins with two chapters on observations, discussing the various methods and their inherent observational biases. This provides the background for later discussions on theories that inevitably measure their success by their agreement with observation. Chapter three provides a summary of resonant interactions between bodies in a solar system. The next three chapters summarise the methods by which planets are believed to form and describes the computer models used to simulate this, along with results. In these chapters, space is devoted to discussing both the core-accretion model and the disc-instability model, as well as the specific (and astrobiologically relevant) case of the formation of terrestrial planets. From there, chapters are devoted to the formation of brown dwarfs and how these are distinct from giant planets, the chemical composition of exoplanets (again, relevant to astrobiological research) and the mechanisms by which giant planets are believed to migrate during the formation process. The topic of resonances between planets is revisited in detail in chapter 10, followed by a chapter on the dynamics of planet-planet scattering events. The final chapter is devoted to the concept of tides on exoplanets, with a section explicitly devoted to the habitability implications of tidally locked planets. This book is written at around postgraduate level and requires a good understanding of the background physics (such as gravitation, resonances, fluids) to get the most out of it. I would not recommend it for the casual reader, certainly not as a first port-of-call, but perhaps as a reference book for someone wanting more depth than is offered by popular science books. Similarly, it does not contain much explicit information about the astrobiological implications of the various results. For that reason, I see this as a starting point or a reference volume for anyone requiring a summary of the current state of the field. 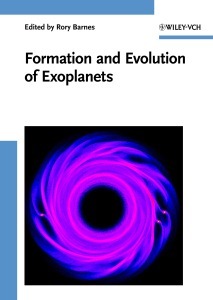 For researchers in other fields, I can certainly recommend it as a handbook to the key points of our current understanding of formation and evolution of exoplanets and as a place to find key equations, tables and explanations. As a collection of review papers, each chapter is fully referenced, with many chapters containing well over a hundred references and only one providing less than fifty. Tables of data are given wherever appropriate, with key results shown as graphs or other diagrams (sometimes in full colour). The authors (as this is a review book and not a popular science one) do not shy away from showing, discussing and solving relevant equations. While the field of extra-solar planet research is a very fast moving one, and I cannot say how long this book will remain “current” for, it certainly provides an excellent summary of the current state of the field. Given the price, I would most certainly recommend at least a perusal of a library copy of this book for anyone interested in a deeper understanding of current theories on the formation and evolution of exoplanets. While it is not specifically aimed at an astrobiological audience, its relevance to the field cannot be denied.